North Carolina governor Gov. Pat McCrory issues executive order on HB2. North Carolina Gov. Pat McCrory has now purported to soften HB2’s sharper edges—but his executive order does fairly little. North Carolina Republican Gov. Pat McCrory issued a somewhat bizarre executive order on Tuesday, purporting to reform HB2, the vicious anti-LGBTQ measure he signed into law less than three weeks ago. Among other things, HB2 forbade trans people from using the bathroom that aligns with their gender identity in any government building, including state universities, and nullified local LGBT nondiscrimination ordinances. The law also revoked all North Carolinians’ right to sue for discrimination in state court. It was met with an avalanche of outrage from a diverse coalition including business leaders, celebrities, and sports associations. 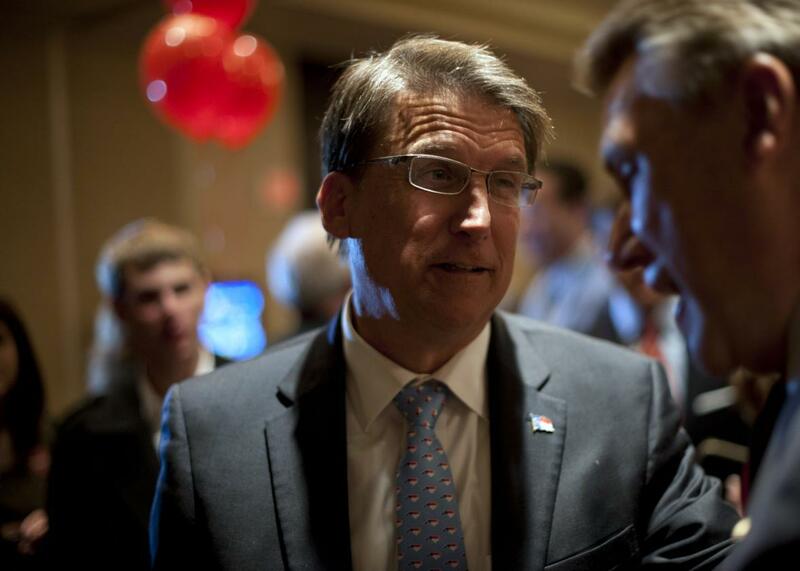 McCrory, clearly caught off guard by the severe backlash, has now purported to soften HB2’s sharper edges—but in reality, his executive order does fairly little. It maintains the anti-trans state bathroom policy, which McCrory calls ”common sense,” and “affirms the private sector’s right to establish its own restroom and locker room policies.” Yet that was never in doubt: HB2 always allowed businesses to create their own bathroom regulations. So the executive order effectively does nothing to address HB2’s most castigated component. Similarly, the executive order “affirms the private sector and local governments’ right to establish non-discrimination employment policies for its own employees”—but this, too, fails to address the actual problem created by the bill. HB2 voided citywide nondiscrimination ordinances covering all employees within the city, not just government workers. In fact, the bill explicitly allowed cities to maintain previous policies regarding municipal workers. So this portion of McCrory’s order changes absolutely nothing. The order does have one important provision: It “[e]xpands the state’s employment policy for state employees to cover sexual orientation and gender identity,” meaning the state government cannot discriminate against LGBT workers. But how can that be when a state law still forbids trans state employees from using the public bathroom that aligns with their gender identity? After today, one North Carolina law (the executive order) prohibits discrimination against trans government employees—and one law (HB2) mandates it. McCrory has only added an extra layer of confusion to an already baffling situation, creating an internal conflict within state regulations that already conflict with federal law. Finally, McCrory’s executive order encourages the state legislature to restore North Carolinians’ right to sue in state court for discrimination. This provision constitutes the order’s only about-face, and it is quite puzzling. Less than a month ago, McCrory was so eager to rescind this right that he merrily signed a bill abrogating it. For nearly three weeks, he vehemently defended that bill, including the provision he just urged the legislature to repeal. Wherefore the flip-flop? What happened in the last three weeks that suddenly convinced McCrory to disavow a central goal of his own pet project? These dangling questions all add up to the impression that this executive order is a poorly thought out stopgap designed, most likely, to forestall a forthcoming civil rights suit. It does not represent an apology or a serious improvement. In announcing his executive order, McCrory accused HB2’s opponents of spreading “misinformation, misinterpretation, [and] confusion,” and of exhibiting “selective outrage and hypocrisy.” Now he has issued a new set of rules that will only serve to further obfuscate the effects of the law that he himself cheered from its first reading to its final passage. There is certainly a lot of misinformation and hypocrisy surrounding HB2. But it is not coming from the law’s opponents.